Pizza ruling in Congress: What is a vegetable, really? But neither is anything else, really. Of course pizza is not a vegetable, but you might as well call it one. “What’s next?” Colorado Democrat Jared Polis mused in the House of Representatives on Thursday. “Are Twinkies going to be considered a vegetable?” Probably not, even though shortly after Polis yielded the floor, the House voted 298-121 that a slice of pizza spread with two tablespoons of tomato paste should be counted as a vegetable, at least when it’s fed to schoolchildren. Obama signed the bill into law on Friday. The episode inevitably brings to mind the Reagan administration’s brief advocacy, in the fall of 1981, for the vegetable status of ketchup. It shows how far we’ve come as a culture, I guess, that pizza sauce instead of ketchup was at issue this time around. 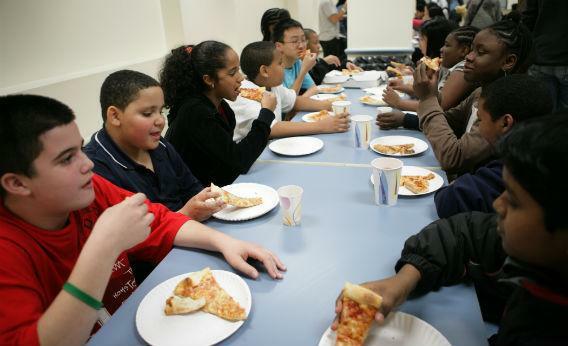 It’s also a significant victory for food manufacturers, who can continue to market frozen pizza to schools by pointing out that for every slice of pizza the school district can put on a student’s plate, the government will reimburse them for their promotion of good health. It’s absurd to call pizza a vegetable, of course, but not for the reasons you think. Pizza may not be a vegetable, but that’s only because vegetables do not exist. I was made aware of this surprising fact in my early 20s while working as a cook and waiter at a restaurant that served mostly vegetarian food. One day, I was bringing a salad to one of the regulars, a botanist named Tim. Being young, I was in a questioning mode, and asked Tim to weigh in on a controversy that I thought had been discovered by my generation: Were tomatoes fruits or vegetables? He told me they were fruits, and that moreover I was begging the question. (Tim was a professor.) To a botanist, he said, there’s no such thing as a “vegetable.” The word has no scientific meaning. The question I was asking presented a false choice. As the ripened ovary of a pollinated flower, the tomato is most assuredly a fruit. So is the seemingly vegetal zucchini, the eggplant, and the pumpkin, as well as the nutty chestnut (but not the peanut, which is a bean). The foodstuffs we usually call “vegetables” can be fruits, but they can also be roots, stems, stalks, seeds, or indeed any part of a plant that we find edible. Now, a catch-all category such as “vegetable,” though imaginary, is not without its uses: Carrots and celery may have almost nothing in common other than their both being plants, but they do share a certain gestalt; so while calling one a taproot and the other a petiole might be correct in the botanist’s sense, it would probably strike your average eater as somewhat beside the point. In the absence of scientific rigor, we slog through the marsh of culture. One of the squishy criteria used to determine whether a plant is a vegetable is how sweet it is before it’s cooked. Thus the controversy over tomatoes, which seem to be in a gray area when it comes to raw sweetness, but the lack of controversy over butternut squash, a fruit (universally acknowledged as a vegetable) that tastes like candy after a long roasting. With the exception of salad greens (stems, leaves, sprouts), we tend to cook vegetables to make them palatable. But the cooking process cuts both ways: It also has the power to transform vegetables into junk food. Most people don’t consider a raw potato an edible food, but they’d still probably call it a vegetable. How many parents would call a French-fried potato the same? The same doesn’t apply to other food groups—drop a breaded cube steak in the same fryer and it’s still meat. On some level, then, we sense that “vegetables” belong to a made-up category and are therefore ours to define. It was by means of this fuzzy botany that, 20 years ago, the frozen-foods lobby was first granted an exemption in the USDA’s school-lunch regulations when it came to tomato paste. The industry-friendly rules allowed two tablespoons of tomato paste, the amount on a typical slice of pizza, to be counted as equal to half a cup of whole tomatoes. Half a cup also happens to be the U.S. Department of Agriculture’s definition of a full serving of a vegetable. This dispensation, specifically, is one of the provisions that the Obama USDA had recommended doing away with but which the food lobby defeated.